Everyone wants a six pack right? It is the epitome of male strength and health. So, why is it so hard to get a six pack? First, there are lifestyle changes that you need to make along with exercise. Many men only do one or the other and that is why they are unsuccessful. Here are a few tips, and exercises, to help you get the six pack you have always wanted. Your core does best if it is resisting movement, like keeping you from falling when someone pushes you. Your core should resist and hold tight. 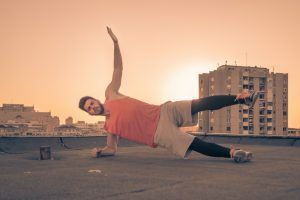 Workouts like a plank exercise are best for these kind of anti-movement tactics. Your abs are not the only thing that you should work in your stomach area. There are many other muscles down there that contribute to the six pack process. Make sure that you are working your obliques, lower back, and transverse abdominis. By also working these muscles you will get an all-around look and prevent any imbalances in your muscle building process. There are many exercises that focus on your core that are standing exercises. If you want exercises that are anti movements, you are more likely to find them in standing exercises. I will give a few examples of these later. You do not need to eat less than you already do, you just need to focus on eating better. For example, switch out your fries with steamed vegetables, get your hamburger without a bun, or switch to light beer or hard liquor. You do not have to starve yourself to get the body that you want. I know that this is basically impossible, but at least try to reduce the stress in your life. Reducing stress in your life is all around good for your health, but it will also reduce the amount of cortisol in your body. Cortisol is a stress hormone and it can help to store fat, especially in the belly area. If you reduce your stress levels, your cortisol levels will reduce, and you will be more likely to get abs. Here are a few exercises that you can do to help get yourself a six pack. You will do this exercise with a kettlebell. If you are a beginner, you can do it without one. Stand with your feet shoulder width apart with the kettlebell or dumbbell over your head. If you are not using one, keep your arms stretched out to the sides. You will bend sideways and bring one arm down to your shin while holding the weight above your head. If you are not using one, take your left arm and reach across so that you are bending and touching your right shin. Then stand up straight. Side plank with leg elevation. Begin in a side plank. You will have your weight supported by one hand, or your forearm if you are a beginner, and your feet stack on top of each other. Lift your top foot and try to keep your body in a straight line. Lower your leg after about 5-10 seconds. You will use dumbbells for this exercise. If you are a beginner, feel free to use a lighter weight. Doing this exercise, you will feel your abs working hard. Start in a push up position, with a dumbbell in each hand. Bring one dumbbell up, into your armpit essentially, and then lower it again. Do all reps on one side and then switch to the other side. You will hang from a bar in this exercise. Your arms will be bent at a 90 degree angle. Raise your legs up and try to keep them straight. If you are a beginner, bending your legs is okay. This is an easy exercise that will work your abs hard. You can use a rack, chair, or a table for this exercise. Start with your feet shoulder width apart and place one hand on the object that you are using. Lower yourself until your chest touches the object and then lift yourself back up. Do as many reps as possible on one side and then switch to the other. You will use the loops on a suspension trainer for this exercise. You will be in the plank position with your feet in the loops of the machine. You will bring your knees up towards your chest and then bring your feet back towards the machine. This is an easy exercise, if you have the machine, you will be able to do plenty of reps with this one. You will use the loops on a suspension trainer for this exercise. You will be in the plank position once again. Your hands will stay on the floor, with your feet a few inches off the ground, and you will bend at the hip. You should make a V shape by bringing your feet towards your head. This exercise is a little harder, but you will see great results from it. You will be using a box, bench, short chair, or couch for this exercise. You will begin at the top of a push up and then walk your hand up the object you are using. Your core will be braced while you are doing this. Walk your hand back down the object and then do the other side. Getting the six pack that you have always wanted is not completely out of reach. All you need is the right attitude and the right exercises to get you there. Depending on how fit you are now, the time it takes to get a six pack varies. If you are already slim and just looking for that extra boost, this will not take too long. If you trying to lose weight and also obtain a six pack, it make take a little longer. No matter what, your dream six pack is not as out of reach as you may have believed.